There haven’t been any new releases by Microsoft since Windows 7 Beta officially released for general public to free download. However the development and improvements of this operating system are still being conducted. 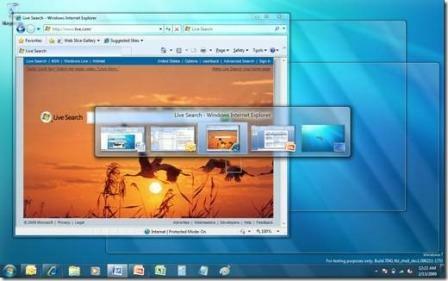 There are working on it to develop and improve features of Windows 7, which is according the feedback of multiple users. Finally list of improvements and new features has been posted officially. Users can still toggle between current open multiple windows using Alt + Tab keys. However if you want more in-depth window information then Aero Peek will appear. This will be launched by the time delay of your pressing keys through open windows. Users can use Windows logo + “#” (where “#” refers to an item’s sequence in quick launch) keys in order to switch or launch programs that are currently showing in quick launch, taskbar. For example, if you need new instance of any open tab such as for IE, just press SHIFT key + Windows Logo + “#”. You can jump to list of any program by pressing Alt key + windows Logo + “#”. You can go back to any last active window of a specific program by pressing Ctrl + Windows Logo + “#”. Check out all Windows 7 keyboard shortcuts. In order to get the 7 flashes in your Windows 7, users initially need to change flashing animation curve then use bolder orange color. Finally you can double the frequency of flashes which is already set at three. By pressing and holding SHIFT key drop the selected file on desired program. Users can squeeze or compact items in 24-39% before taskbar scrolls. However it is depends on resolution, default notification area, and icon size. All newly installed programs will be surfaced at bottom of the start menu automatically. Users can easily access to them and drag them to the taskbar for quick access. This update will display users more clear and hot-track effect, when mouse will be over any thumbnail. Currently jump list shows only 10 items automatically. With this update users can easily customize jump list settings. Users will be able to pin programs to jump list easily. This update will increase flexibility of jump list. This update will allow users to hide their icons or gadgets separately, by having independent control. The show desktop button is improved and allows users to peek at desktop easily. Now with taskbar’s thumbnails support touch option, you can drag finger across the UI and launch Aero Peek. Multi-touch feature allows users to have realistic experience of pressing multiple keys on the touch keyboard. Now users can simply touch any item using one finger, and tap on the context menu with another finger. Now users can easily drag and drop selected items with touch. This optimized feature is developed for two common actions – Dragging left to right and scrolling up-down. Latest overlay icon is displayed when local connection is available without internet access. There is prompt on every modification made to UAC control panel before implementing. Locking a machine without any screensaver.